The Centre wishes Mrs Amy Finlayall the best for her Honours research year after successfully completing her Vacation research project with the Freemasons Foundation Centre for Men’s Health in May 2014. Amy completed her double Bachelor degree in Psychological Science and Health Science (public health major) in early 2014. 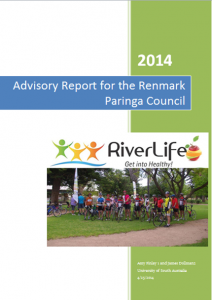 Amy’s project was to investigate the poor uptake by men of a community walking intervention in the Riverland region, and this work formed the basis of an Advisory Report for the Renmark Paringa Council’s program “River Life”. The project was supervised by Associate Professor Jim Dollman, Health Sciences, University of South Australia. For her project, Amy undertook a literature review to investigate men’s involvement in health promotion activities, specifically focusing on walking groups and men’s perceptions towards health groups. The Riverlife campaign is in response to the evidence that rural men’s health is poorer than their urban counter parts with higher rates of obesity, heart disease, poor mental health and diabetes. The literature suggests the need for gender-based consultation for health groups. It highlights that men often associate diets, healthy eating and health groups as feminine and that men respond better to programs such as gyms and football training than to walking groups, and would prefer to walk alone. Amy also interviewed local media with the view to build relationships to use of print media for health promotion because rural areas prefer and value their local print media to mainstream print media. Some of the recommendations for Riverlife were to i) link in with football or similar community based organisations to facilitate the walking group aimed specifically at men and ii) for regular short articles in the local paper or radio and involve members of the community such as football coaches and doctors in this process. This entry was posted in Research and tagged health promotion, intervention, lifestyle, physical activity, rural health. Bookmark the permalink.